People pack into Centrio Mall daily, but on weekends, it's a different story. This led me to discovering a fresh lumpia I have not heard anyone talk about. Egan and I were just roaming around the mall looking for somewhere to eat late lunch. Fast food chains were full even at 1pm and our stomachs were complaining already! We were not craving for fast food anyway so we checked restaurants (that we can afford that day -- if I may add). But nope, it looked like a family was having a reunion in our favourite tinola place. So we surrendered and decided we will go to the next mall. From the 3rd floor we took the elevator in front of True Value and went straight down to the ground floor. When the elevator doors opened, we took a left. We were walking towards the Rustan's Supermarket exit when we saw vacant tables and chairs for Yum Yum Tree. We decided then and there that we will dine in the place. Out typical SOP is ordering one dish splitting the viand and just ordering extra rice to make it two meals instantly. We were looking for vegetables so we looked for another food item in the menu. I thought what about pinakbet? Oh no, we saw the adjacent table and saw that it was huge with the bagnet pieces. Yum, but maybe next time. We did not regret it at all! 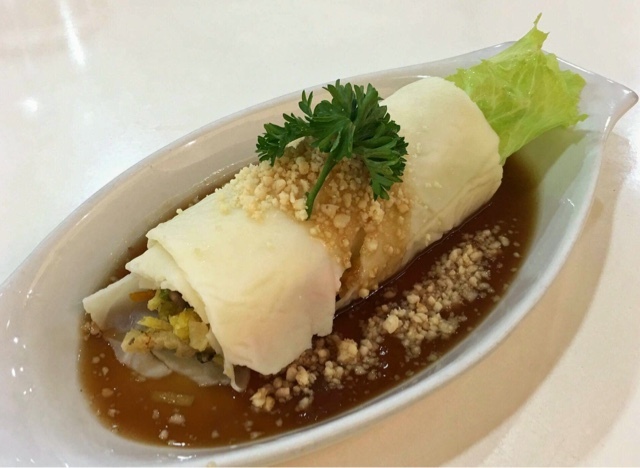 The sweetness of the potatoes and peanut sauce went well with the soft textures of the wrapper and the crunch of the turnip slices. We did not expect to like the Baguio beans and tofu in it as well. Personally, I would've wanted more lettuce on it. But when we had it, it was gone within 10 minutes. I'm not a fresh lumpia expert, in fact I usually prefer the fried type but this was just enough to pair with our main dish -- Breaded Porkchop. It had two pieces. 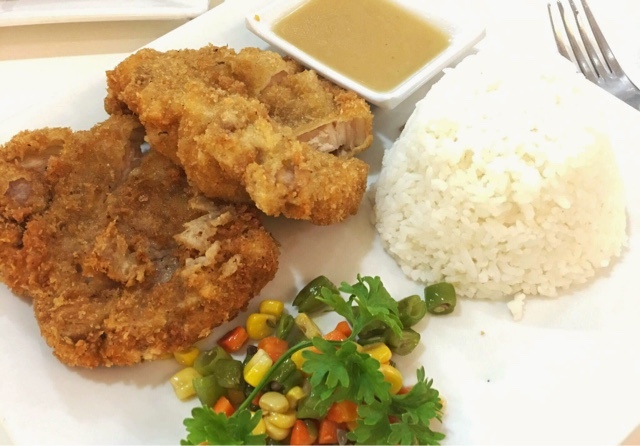 Our bill total 275 Php -- Lumpiang Sariwa (85 Php), Breaded Porkchop (145 Php) and rice (20 Php). Egan and I were more than fulfilled to have had a sulit meal in a food place in Centrio Mall on a weekend that was not crowded with people. Tip: 10% Service charge will be billed to you when you dine in. When you take your food out, this is waived. Eversince, I have had the Lumpiang Sariwa for merienda two more times. I like it and noone I knew seemed to talk about it, so I am. Yum Yum Tree is located in front of the Rustan's Supermarket in Centrio Mall, Corrales Ave., Cagayan de Oro City. It is open during mall hours: 10:00am-9:00pm daily.